Shopping for Suicide Squad Action Figures: Bendables? Recreate the epic mayhem and crime-fighting thrills of DC Comics' Suicide Squad movie! 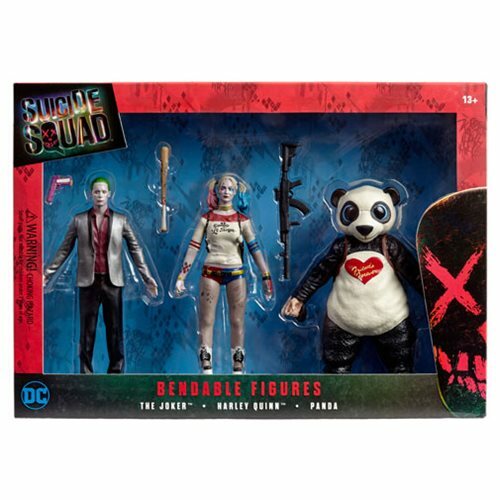 The Suicide Squad Bendable Action Figure Boxed Set includes bendable figures of fan favorites Harley Quinn, The Joker, and Panda. Highly detailed, these action figures can be bent and posed any way you like giving you endless possibilities to cause havoc or even recreate your favorite pose. The Suicide Squad Bendable Action Figure Boxed Set is a must have for fans of Suicide Squad. Panda measures about 5 1/3-inches tall. Harley Quinn and The Joker stand about 5 2/5-inches tall. Ages 13 and up.